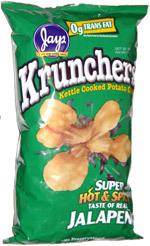 Taste test: These kettle-cooked chips were very irregular in shape and texture, with a thick cut and lots of crunch. They had tons of jalapeño taste, and a fair but not overwhelming amount of jalapeño heat. 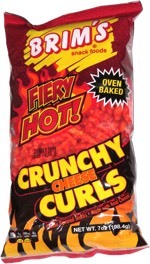 (The "super hot & spicy" claim on the bag is a bit of an overstatement.) Some of the chips in the bag could have stood to be crisper, and a few of them had some awkward hard spots in them, but generally these were good jalapeno chips. Smell test: Good, strong jalapeno smell. Made my mouth water.